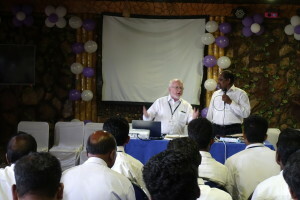 It has been a great privilege to serve the Lord in India for over three weeks. It has been a stretching, inspirational, humbling, encouraging, convicting, faith building experience, and has increased my hunger for the Word of God. What a privilege, what a blessing has been mine! Thank you Lord. God is so good. And thank you MTM for inviting me to serve. The Entire OBS group along with the teachers! Raymond & Naomi Burkholder, Ricky & Maria Wright and Earl Peachy. I have enjoyed both couple’s meets in Cuttack and in Bhubaneswar. The interest and desire for instruction is moving. Yes indeed, I missed my wife especially at the couples meets. I enjoyed the 3rd annual Odisha Bible School. Bro. Ricky Wright taught from II Timothy and Brother Raymond taught World Evangelism taken from the book of Acts. I taught from the Sermon of the Mount. The students were attentive, respectful, hungry for teaching, and responsive. They took notes while we spoke. We received requests for copies of our notes as well. What a wonderful privilege to share the Word of God to such a receptive audience. I especially enjoyed hearing some of the students’ testimonies of salvation. They have persevered even while facing great difficulties. I was moved by the tears that were shed at various times. The spiritual climax (as I perceive it) occurred the night before graduation as Bro. Raymond preached on Being Filled with the Holy Spirit. We were given opportunity to respond to the message and the response was overwhelming. The tears, the commitments made to place ourselves on the altar, yes, only God knows what the outcome will be. I was glad to be able to meet the local Bible School committee. Binay Bardhan, the chairman of the committee told us that there are 79 unreached people groups in Odisha state alone. One of my prayers before arriving here was that God would use this Bible School to impact some unreached group. I was encouraged to learn that Binay has been interested in and focusing on UPGs. Brother Earl Peachy, teaching the Truth of God’s Word! It was a great privilege to work alongside Raymond and Naomi Burkholder, and Ricky and Maria Wright. I had never met Rickys till this time. It is always a blessing to meet other laborers in the Vineyard. This was my first involvement with MTM and I can say that Raymond did a very good job of watching out my needs, etc. I enjoyed our team time together. Think about it, friends, can we ignore the call that comes from many places for solid Bible teaching? “Come over to Macedonia and help us”. How can we overlook this call? Can we act as though we do not hear it? We who have so much, they who have little, can we turn them away? How shall we stand before God and have refused to listen to their requests? Nay, brothers, we must pray, we must send, we must go. Almost ten years ago I heard about MTM at our annual Beachy ministers’ meeting. The point was made that more could be done if only there were more brothers willing to go and share as teachers. I was moved….moved enough to do something uncharacteristic for me I volunteered. Now after many attempts, it has finally come to pass. Perhaps someone reading this is also willing to assist if asked to do so. My friend, just a “small suggestion” to you…follow my example….and contact MTM! Brother Ricky faithfully teaching these many open hearts! Wow, what can one say about the privilege of speaking into the lives of thirty men for three weeks? Especially when that speaking, is speaking the Word of God. 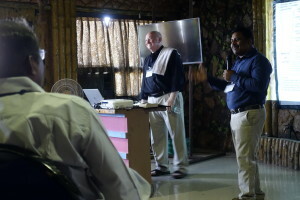 I was delighted to have this chance to participate in the Third Annual Odisha Brethren Bible School. Having been with MTM three times before, I knew that the time was going to be special – but, not this special. For three weeks I marveled as the students sat on the edge of their seats and kept copious notes of each speaker, and every word. For one year, I had prepared my heart, my notes, and my own self for the task of teaching the Book of Second Timothy. Now, it was too soon over. But, not without the wonderful feeling of joy that the message was received with full and thankful hearts. Student after student blessed us as they would take the time to thank us each day for the teaching that we offered. It became a little embarrassing towards the end to receive so many thanks from so many students. But, the sight of seeing the joy on their faces, and the realization that for many of them, the teaching that Brother Earl, Brother Raymond, and myself offered, might be the material that would sustain them through the coming year, and maybe more, was just overwhelming. Was it worth the sacrifices on my part? Was it worth pouring my heart and soul into studies that took a year to complete? Was it worth the expense of round trip airfare to the other side of the globe? Was it worth the expense of missing a month’s salary to go and serve “the least of these, my brothers”? Such a question is often given to me when in the USA. Of course, the answer is a resounding, YES! It is so worth it, that I am planning to give another month to do the same thing again with SLM India, down in and through Andhra Pradesh. And, if the LORD allows, many times more, and many more places throughout India, until the LORD returns or calls me home. ?. 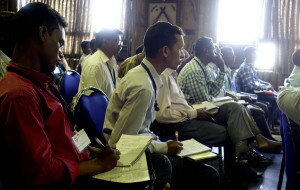 With notebooks and pens in hand, these men were eager to hear more of the Word of God!! My most important thanks go to my LORD, of course. But, also to MTM for extending to me the privilege to participate in the OBS. We also thoroughly enjoyed the Couple’s Retreat in Cuttack. It was an added joy to see the 100+ couples participating in Christian relationship training for two days in Cuttack. Seeing so many familiar faces from our time of living in Cuttack in 2015 was almost more joy than one man can handle. The outpouring of God’s Spirit as the couples re-dedicated themselves, their spouses, and their homes to living a truly Christian example in the face of the thousands of temples and idols (and the darkened eyes that accompany them) that surround these couples and families every day, was a sight to behold. No turning back, we will follow Him. To God be the glory both now and forever. Editor’s Note; The testimony above was written by brother Ricky Wright. Ricky and his wife Maria Wright are from Jackson, Georgia and are presently serving the Lord as short-term missionaries to India through SLM. Blessings in Jesus Name to both Ricky and Maria for serving the Lord with MTM. Thank you. CLICK HERE TO SEE THE ENTIRE PHOTO ALBUM! !